New Delhi: China’s dream of a blue-water navy — the kind that can operate anywhere in the world — is one step closer to realisation. Its indigenously-built carrier vessel, the Type 002 CV-17 (to be named Shandong), has gone through five trials, and could be commissioned as early as July this year. 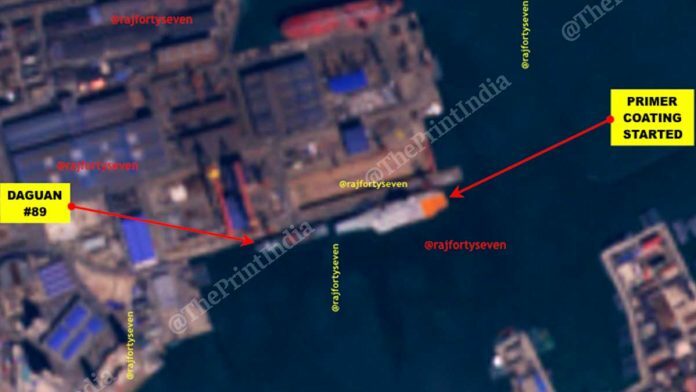 ThePrint had reported in November 2018 that the CV-17, China’s second carrier vessel and the first to be built indigenously, was well ahead of schedule. And the latest satellite images of the Dalian Shipyard indicate that ship has returned from its fifth trial and received a final coat of paint. Any blue-water navy needs carrier vessels, which is why China’s People’s Liberation Army Navy (PLAN) has fast-tracked their development. It is creating the Jiangnan Changxing facility near Shanghai to augment the Dalian Shipyard in faster production of CVs. The CV-17’s fourth trial was conducted in the Yellow Sea and the Bohai Sea. It left Dalian on 27 December 2018 and returned to home port on 8 January 2019. It was observed interacting very closely with other ships and travelling from the Yellow Sea to Bohai in a formation on 30 December 2018. The ship possibly conducted inter-operability tests and synced its electronic equipment and gadgetry with other ships of the fleet. The CV-17 was almost static in the Bohai area. It is speculated that this was for touch-and-go trials, which are more difficult on a static carrier than a moving one. However, no aircraft tyre marks were observed on the ship’s landing strip, so touch-and-go or landing trials cannot be confirmed to have taken place. The fifth trial was a super-short sea trial. It began on 28 February and was completed by 8 March. The PLAN’s original carrier, the CV-16 Liaoning, also moved out of Dalian with its consort ship Daguan #88. Both possibly participated in an exercise being carried out in the East China Sea. Both ships later returned to their home ports, Qingdao and Dalian. The PLAN began repainting of the deck of the CV-17 on 22 March. The primer coat was seen being applied on the deck in a satellite image from 23 March. This coat was observed to be complete on 2 April. The latest satellite images from Dalian indicate that the final coat has been applied on the CV-17. The shade of the new coat is much darker than the previous coat, very similar to its predecessor, the CV-16 Liaoning. Some of the signatures also indicate that an anti-skid coating has also been applied. These are all strong signals that the ship is ready, and could be commissioned in the next three months.